There are so many different kinds of vinegar you can choose from — in my cupboard right now I have organic raw unfiltered apple cider vinegar, premium rice vinegar from Japan, umeboshi plum vinegar, aged red wine vinegar, orange muscat champagne vinegar, chilies and balsamic vinegar, organic balsamic vinegar, organic distilled white vinegar and red red chili vinegar (yes, two reds). At least. And that doesn't include the Marukan rice vinegar and seasoned rice vinegar I received for review, or the gallons of cheap white vinegar I keep in the bathroom and laundry area for cleaning and fabric softener/deodorizer, or to put down the sink with baking soda to keep the drain clear. Seriously. Miso soup with rice noodles. Even with all those choices, when seasoning foods or making sauces or a marinade, the vinegar I turn to most often is rice vinegar. 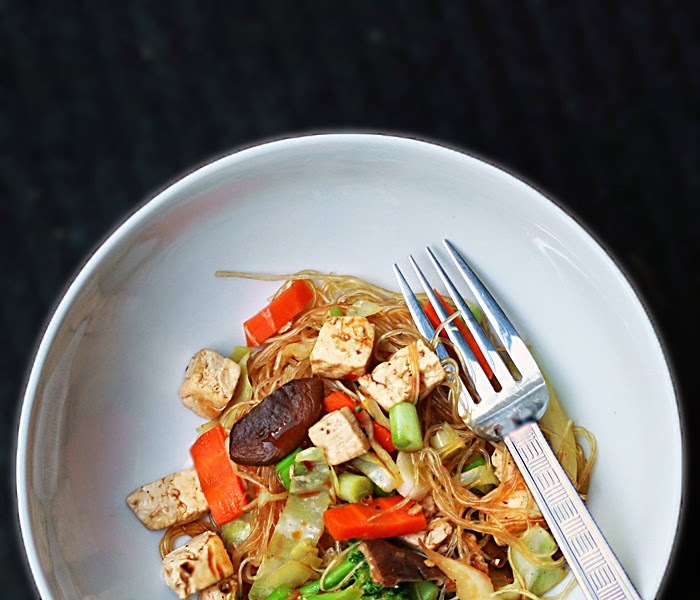 It seems more mellow and naturally sweet than other vinegars, and lends itself well to Asian style stir-fries, soups and bowls, which we cook often. 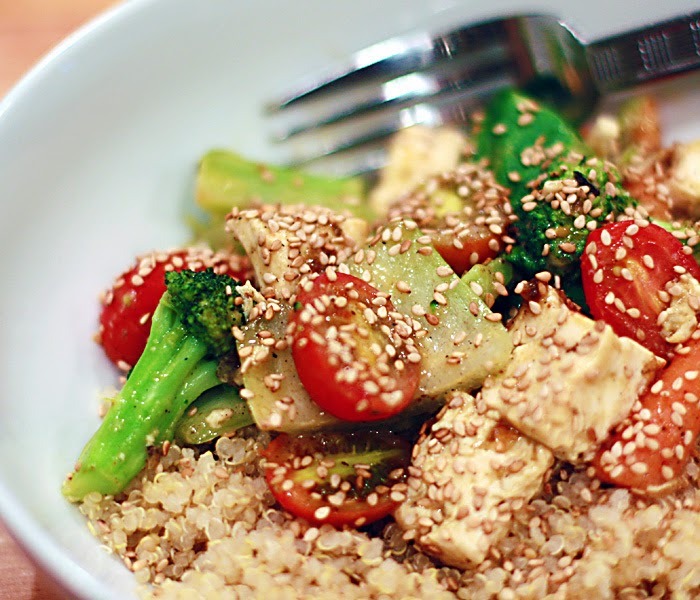 Japanese food especially, requires a subtle, delicate hand with seasoning, as most of the flavor comes from careful preparation of the food, itself, and a touch of mellow rice vinegar can add just the right amount of brightness without overpowering the dish. 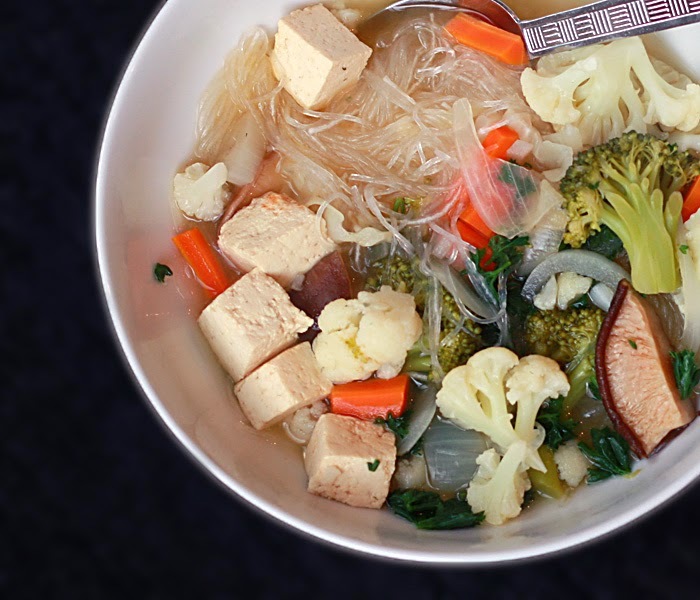 A little rice vinegar can really bring out the flavor in miso soup, for example, and Marukan rice vinegar is a favorite of ours, so I was delighted when I was offered samples to try. I received two varieties of naturally brewed rice vinegar and one bottle of ponzu sauce. Because the ponzu sauce contains wheat-based soy sauce and I have problems digesting wheat, I gave it to my son to try. He used some to marinate tofu and was very pleased with the result. I've been mainly using the plain rice vinegar. The seasoned vinegar tastes really delicious, but it contains 530 milligrams of sodium and six grams of sugar per tablespoon. I prefer to add my own sugar and salt to food so I can control both the kind of salt and sugar I use as well as the amount. Marukan also makes a Seasoned Gourmet Rice Vinegar Lite with reduced salt and sugar if you are interested in using a seasoned variety, but I'd rather season it myself. Old, boring, leftover lentil soup brightened with a splash of rice vinegar. 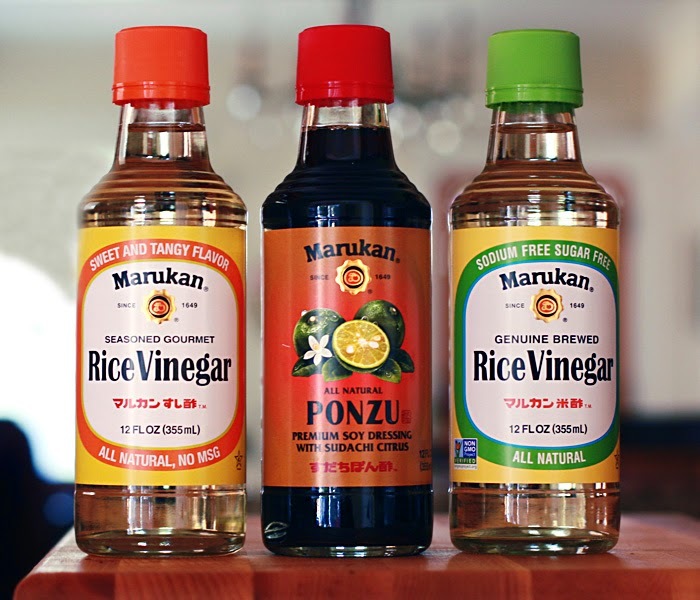 I love Marukan vinegar, and recommend it. The company sells organic versions of the plain rice vinegar as well as the gourmet seasoned rice vinegar, and that is what I would buy. It's worth noting, though, that even the regular rice vinegar is made with non-GMO rice. According to the Marukan Web site, "Marukan Rice Vinegar is made by the cultivation of a slow and delicate process including fermentation, refining and aging — a special technique handed down over 360 years. It is a quality "jun-mai"(pure non-GMO rice) vinegar, brewed from only the finest selection of short-grained rice grown in California and naturally gluten free. "You can find out more about Marukan products here. How do you use vinegar in your cooking or in general? Or do you prefer to use lemon juice? In addition to the uses I've already mentioned, I once used vinegar to remove a wart! And, I know someone who says that taking apple cider vinegar in water after eating has cured his acid reflux. update: I forgot to add to the list that I've used white vinegar to kill weeds. Here is a link to a recipe for homemade weed killer. I haven't tried it yet, but if plain vinegar worked, maybe the jazzed up version works even better. Disclaimer: I was sent three free bottles of Marukan products for the purpose of review. I was not paid. I was not told what to write. 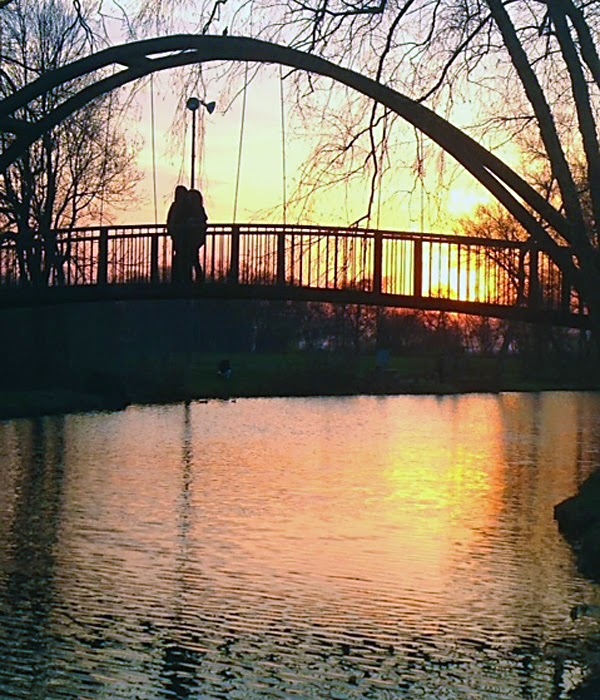 The sun setting at Tenney Park (Susan's memorial). Looks like I've been on a bit of a blog break, doesn't it? I didn't plan it, exactly, but timing and circumstances have a way of shaping life differently from what we might have planned. I meet monthly with a group of women to discuss various topics of interest to us, and last month our discussion was about the best and worst things about growing older. This is a discussion that could take place at just about any age, when you think about it — leaving the elementary school years and entering high school, graduating from college, entering the twenties and thirties and seeing many of your friends get married and have babies, turning 40, 50, etc., etc. For my discussion group, approaching the older end of the age spectrum, we all agreed that one of the worst things about getting older was losing family and friends. The month of April was a particularly tough one for me because in one five-day period I lost two friends — one a good friend with whom I was still close, and the other an old friend who I haven't been in close, recent contact with, but with whom I shared a mutual friend, and loads of memories. Both women died very soon after being diagnosed with cancer — so soon, in fact, that I barely had time to process what was happening. My friend Susan and I had known each other for at least 30 years, and we both left Madison at the same time — she got married and moved to Cleveland, and I moved to the West Coast. After we left, we both planned our summer visits to Madison to overlap, so we could spend time together. Last summer we went to the Art Fair On the Square, as we often had done in the past. We'd also usually try to fit in a contra dance, if there was time. Now there is no more time, and I still can't believe she's gone. She was a soft-spoken and gentle women with a far reach. She was a childbirth educator, storyteller, environmental educator, author of two oral history books, prisoner advocate, and fearless and trusting human being. The fact that three memorials in three different cities are being held in her honor says more than I can write about here. When I learned that memorials were being held the same week in Madison for both friends, I knew I had to go. I believed that sharing my grief with others would help me cope with the loss, but now I realize that only time will do that. I miss you so much, Susan and Carole. The trip was physically as well as emotionally difficult. We caught a 12:30 a.m. flight on Wednesday, arrived in Minneapolis at 3:30 a.m. and were in Madison at 8:30 a.m. We went straight to the co-op to buy food for the memorial/potluck being held later that evening, stopped into St. Vinnie's to grab a couple of serving utensils, then checked into our hotel for a few hours sleep, before heading to the memorial at 5 p.m. It was a beautiful memorial with stories and music, and though the reason for the gathering was heartbreaking, it was a comfort to be surrounded by so many mutual friends and acquaintances. My heart was heavy and my pace much slower than it usually is when I'm in Madison, but we tried to balance the sadness with lighter moments getting together with friends, and visiting favorite, familiar places. On Thursday morning we strolled through the always outrageous Pink Poodle consignment shop. The Pink Poodle is the craziest resale shop on earth — so big you can get lost, and so over-the-top that there's no place to look to rest your eyes. I don't know why I like it so much, but I do love it. I usually find something I can't live without, even though I always complain that it's over-priced. I can't help it. 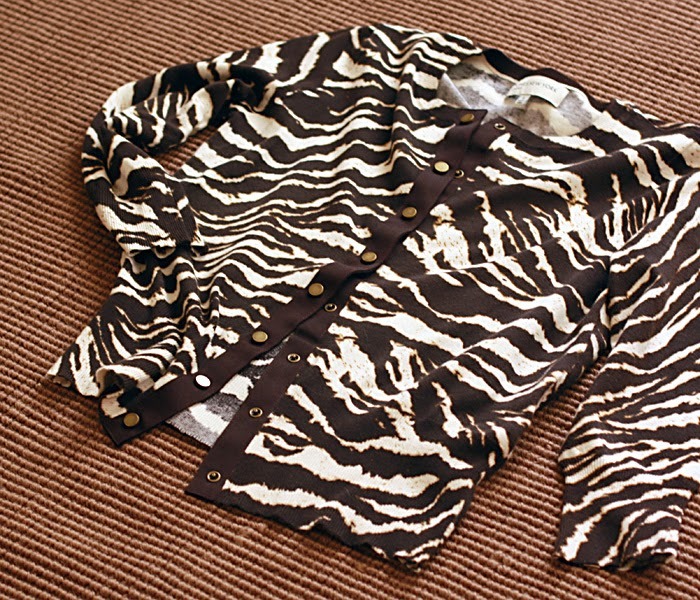 I found a lightweight cotton cardigan with a brown animal print. you want it, too, don't you? After my thrift shop-induced hallucinations, I spent a lazy afternoon with my old next-door-neighbor and-partner-in-crime. We went to the tea shop for lunch, then wandered among the neighborhood shops. Thursday night my husband and I met a group of old friends for dinner. On Friday morning we visited Olbrich Botanical Gardens to wander the beautiful and tranquil grounds, and view the Thai friendship pavilion. We also toured the indoor tropical observatory which we were delighted to find still charged only $2 for admission. After our peaceful garden break, we joined old friends for lunch at The Green Owl, Madison's only all-vegetarian restaurant. I didn't bring a camera on the trip, and wasn't feeling like photographing anything, so you'll just have to imagine my wonderful cajun blackened tofu sandwich. After lunch I paid a visit to a friend who didn't know I was in town, and I'm so glad I did. It was wonderful to see her. On Friday night we had a delicious dinner with good friends at an Indian restaurant. I love when restaurants clearly mark the vegan dishes on their menu, don't you? 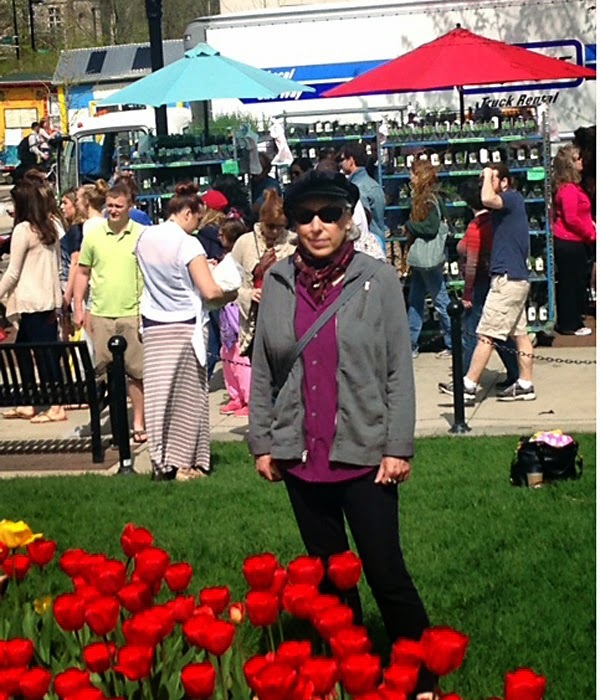 On Saturday morning we headed downtown to the farmers market. It was a little later in the morning than we wanted to leave, but we were hoping that the late start to the growing season would mean smaller crowds — we were wrong. The market is held on "the square" — the sidewalks that comprise the four sides of the capitol area — and it's big and wonderful, filled with food, plants, people, musicians, etc. The lawns around the capitol were green, and lush with flowers and cavorting children — quintessential Madison. Truthfully, I was feeling a little overwhelmed by the crowds, and we only made it around two sides before heading to a children's shop on the square, owned by an old friend, so we could say hello. We also walked down State St., the main shopping drag that connects the downtown with the UW campus. We stopped into The Soap Opera and I purchased a chocolate bunny soap to bring back to Miss E.
We headed back to the hotel to lunch on leftovers, and pretty soon it was time to drive back to the co-op to purchase food for Saturday's memorial, and head out to the country to Carole's simple but beautiful, rustic home. 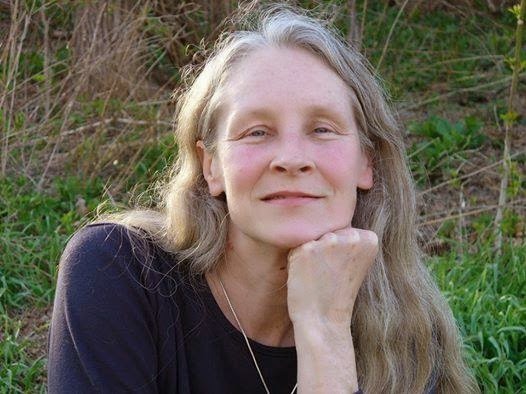 Carole was a registered nurse in her working life, but when I think of her, I think of a woman deeply connected to the earth. She loved her 20 acres — she nurtured her gardens like they were her children. Carole shared her life with horses and dogs, and they were there along with her friends and family. I connected with people I hadn't seen in a long time as we shared memories and sadness. After the potluck, we were all gathering on the lawn to start sharing stories, when rain started to sprinkle on us. It wasn't much — just enough to form a large rainbow in the sky as if Carole were saying, "hello." Mothers Day dinner by Aaron and Kate. We caught a 7 a.m. flight back to Seattle on Mothers Day, and arrived at the airport at 10:30 a.m. It's two hours earlier here than in Madison, and the lack of sleep, time zone changes, stress, sadness and what have you, left me in a daze. Reading and writing blogs was not gonna happen. 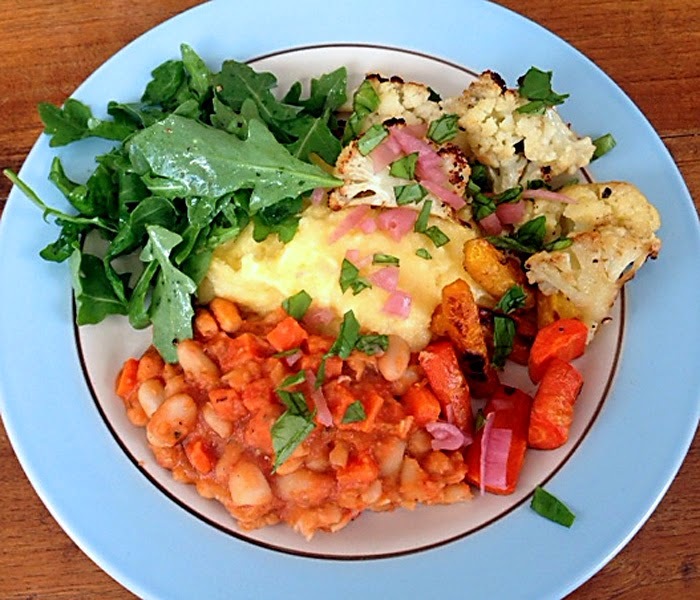 We had a lovely Mothers' Day dinner (polenta, roasted cauliflower and mushrooms, white beans, and arugula salad) at our son's and his gf's house, before heading home and collapsing into bed, exhausted. No cacao nibs? No cashews? No greenish bananas? Cooked and raw salad with quinoa, mango and sesame seeds. No matter what you choose to eat, you can find people who eat the same way as you, and an expert confirming that you're on the exact right path to health. Or, if you wish to avoid a particular food, there's someone out there who will agree it should be avoided. I'm not talking about common sense things like avoiding foods you're allergic to, or which obviously cause you digestive issues, but foods that seem to be perfectly healthy choices. Deciding which foods are healthy is a mine field, which is why I almost never suggest that people should eat one thing or another. I have my food beliefs and preferences (prejudices) but I don't hold myself out as an expert who knows the 'truth.' And what is the truth? I choose to be plant-based because I don't want to kill or cause misery to animals, and I wish everyone would give up or reduce their use of animal products. And, although I suspect a vegan diet is healthier than a meat-heavy one, I don't like to proselytize about the health aspects of a plant-based diet because I don't know for sure, and there are plenty of experts to turn to if you want an official opinion. I may eat very little sugar, try to avoid GMOs, excess salt, high fructose corn syrup, isolated soy protein, and other things that my research has led me to believe are probably unhealthy, but, I tend to avoid preaching about it here because I think people have to make their own food choices based on their own fact seeking, not mine. 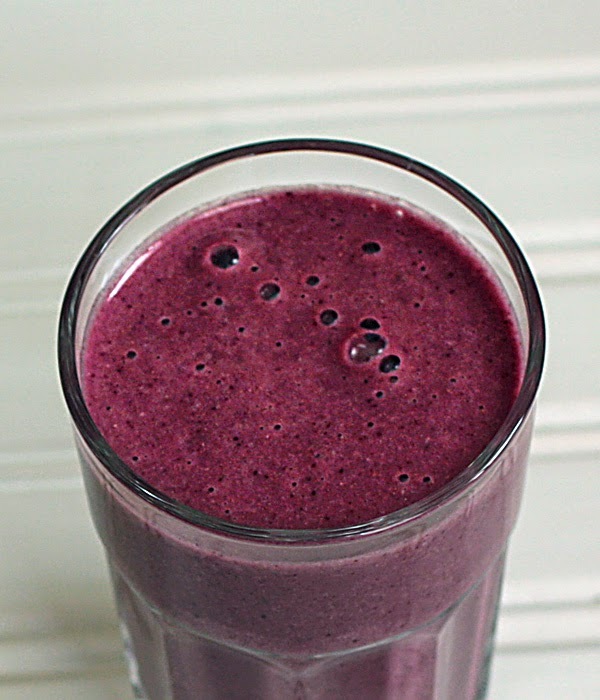 Berry smoothie with cacao nibs. I read and listen to lots of opinions about diet — and not just about the particular diet I follow. One day a few weeks ago I came across a video from the 2013 Woodstock Fruit Festival in which 12 raw food experts were each asked to name one food that should be avoided or never eaten. One gave a very sensible answer to avoid any food, even if you love it, that doesn't love you back. I started avoiding gluten after I finally made the connection between gastric distress and what I was eating. It never occurred to me that gluten was an issue for me until it had been in the limelight for a while and I finally started paying attention. Good advice to listen to your body! Two other interviewees said to avoid unripe fruit —especially green bananas. I kind of prefer bananas with a bit of green, but the explanation made sense. 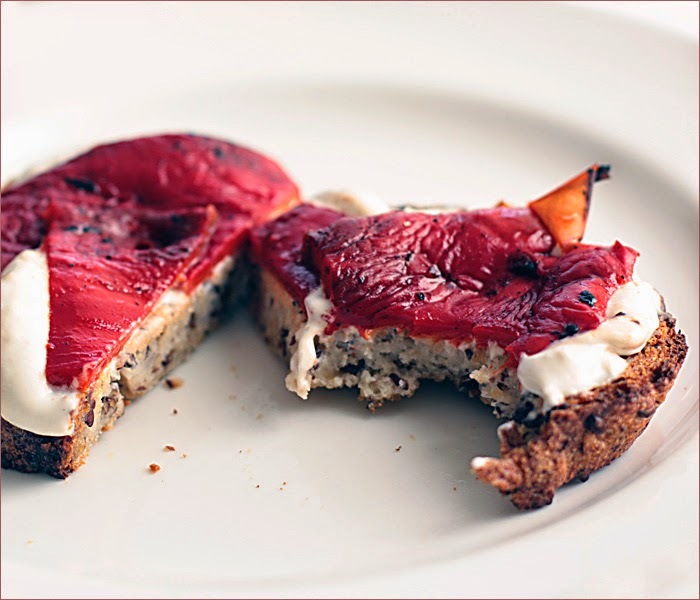 Cashew cheese with smoked red pepper on gluten-free bread. Some of the other foods to avoid might surprise you, since they are things that often turn up on lists of good foods to eat. Keep in mind the people being interviewed were all raw foods advocates, so their perspective may be a little different from yours or mine if raw foods are just part of your diet rather than the entire thing. They were trying to avoid foods that they believe aren't truly raw (cacau nibs, cashews, Bragg's), as well as raw foods they think are unhealthy. 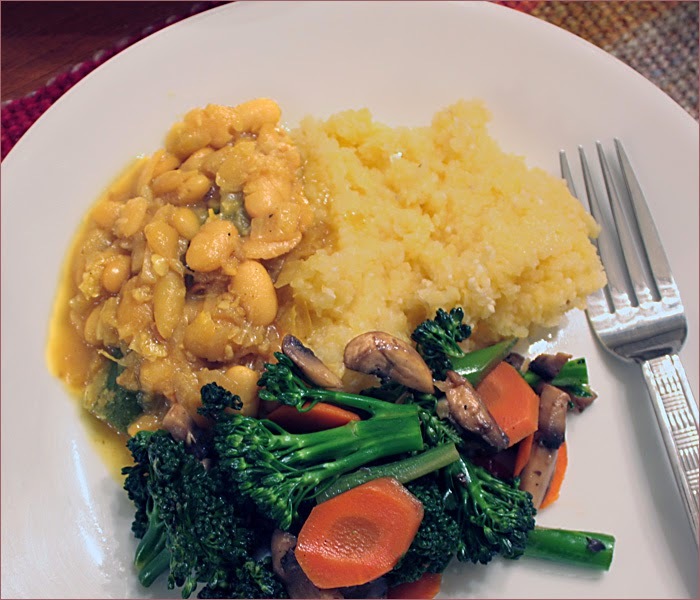 Cooked veggies, polenta, and beans with lots of garlic. On the list were cacao nibs, cashews, Bragg's liquid aminos, agave nectar, garlic, jungle peanuts, and GMOs. Cacao nibs and cashews actually showed up twice on the list. I've often seen the exact opposite advice — eat cacao nibs, cashews, garlic and Bragg's. It's confusing navigating the food-for-health world! Here's the video if you want to watch and get some context as to why some of the foods were chosen. It's often surprising to me how a food or group of foods will be deemed healthy and necessary by one group, and demonized by another, Olive oil, grains, and fruit juice come to mind. What foods do you see as controversial? Do you have certain foods you believe should be avoided? Did any of the foods on the list (like garlic) surprise you? And what the hell are jungle peanuts? Labels: vegan food, what foods to avoid, what is healthy vegan food? I'm usually pretty cautious when it comes to accepting products for review. It has to be something I think I'll like and will probably use, and if it's food, it has to be vegan, gluten-free and reasonably healthy. I know not everyone requires their snacks to be healthy, but I prefer to eat mainly healthy things — or at least not outrageously unhealthy ones. I don't want to consume GMOs, and I try to avoid palm oil. When I was asked if I'd be willing to review Zouq Indian snacks, I didn't think much about any of those things — only about the addictive fried lentils and other spicy snacks I've purchased in the past from farmers markets and Indian delis. So am I a hypocrite? Maybe. I received four cans of puffed, fried snacks ranging in weight from 2.47 to 3.88 ounces, with varying serving sizes of three to four servings per can. The cans have an easy-off tab top and a plastic lid, with a recommended shelf life of 14 days after opening. I don't think consuming them within 14 days should be a problem for anyone. Not consuming them all in one day is more likely to be the issue. I've just munched one serving — of each — meaning I think I just had snacks for lunch. As you can see there are four flavors, and I'll tell you a little bit about each one. 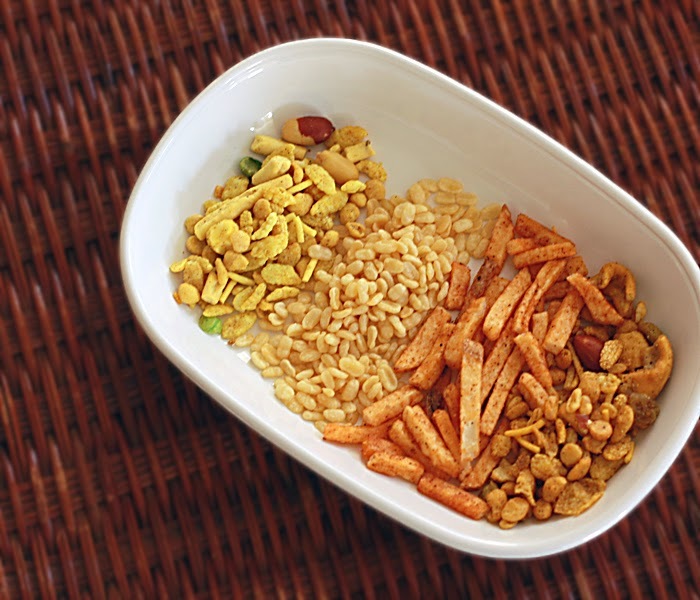 On the left in the dish is Curry Crunch, with a sweet curry flavor and no heat. I tend not to like sweet snacks as much as savory ones, and that was the case here. 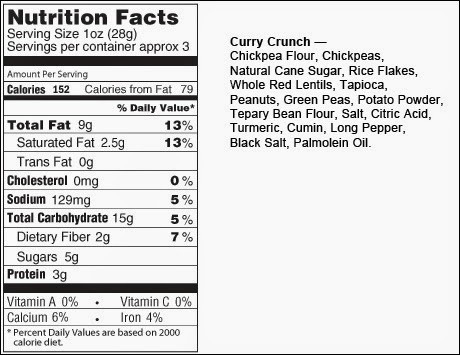 The curry crunch was my least favorite of the group, though if you like a little sweetness to your snacks, this might be for you. 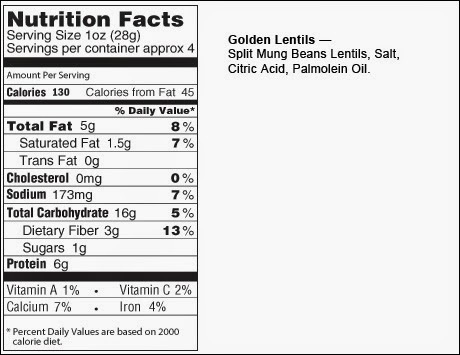 Next in line are the Golden Lentils, with a mild, toasty, saltier flavor. I really liked these a lot. 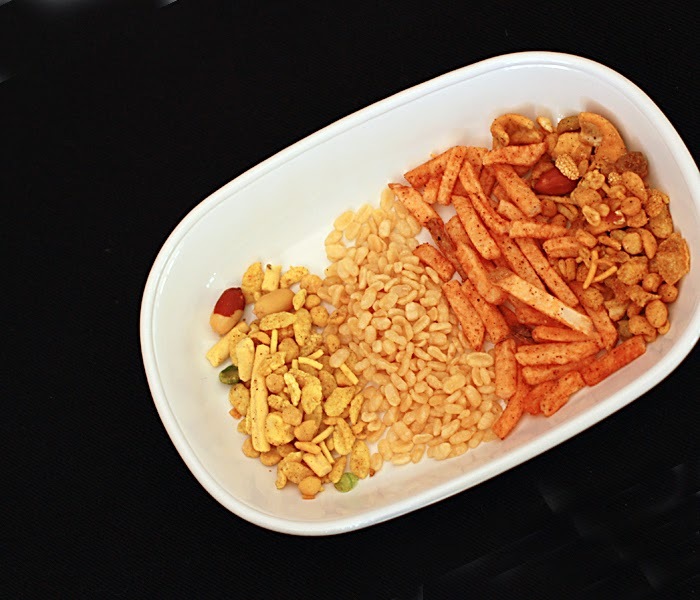 Third from the left are the Fiery Sticks, crispy and salty with a spicy kick and a slight tang from mango powder. The crunchy sticks were my favorite, and in fact, they're gone. 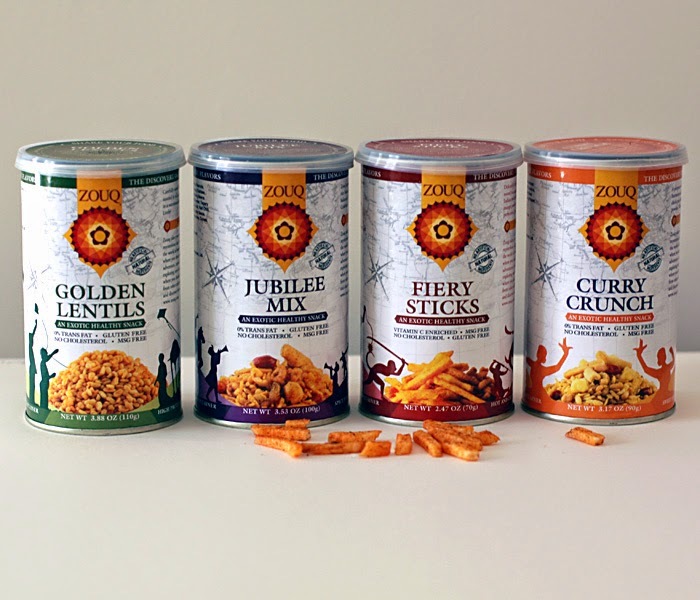 Last is the Jubilee Mix, another curry mix with a bit of spiciness and a hint of sweetness. The mix also contains fennel seed, but in a modest proportion that made me take notice, but not scream. 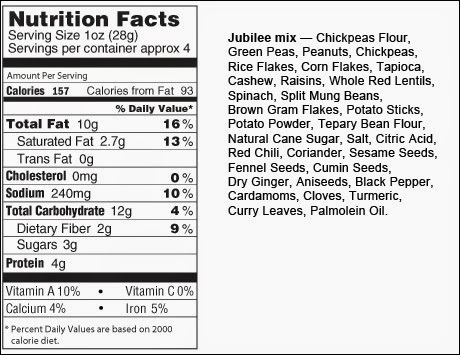 Here are the ingredients and nutrition facts for the Zouq snacks I sampled. 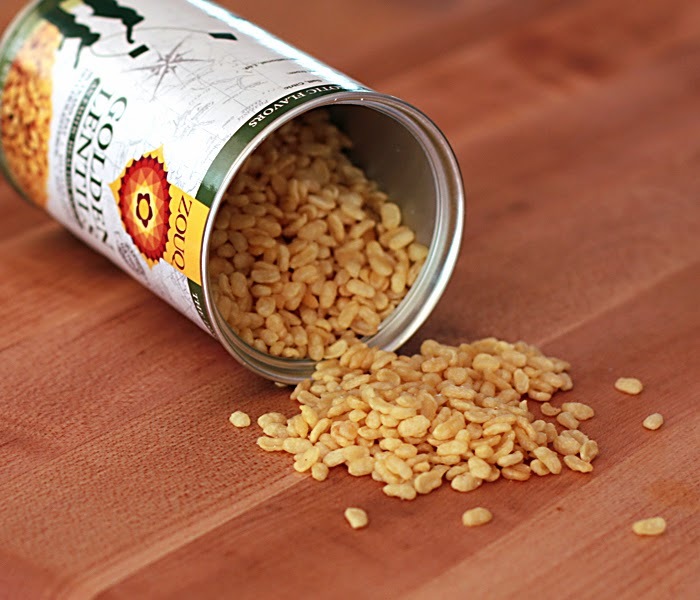 The ingredients aren't labeled organic — they have the ambiguous "natural" label. 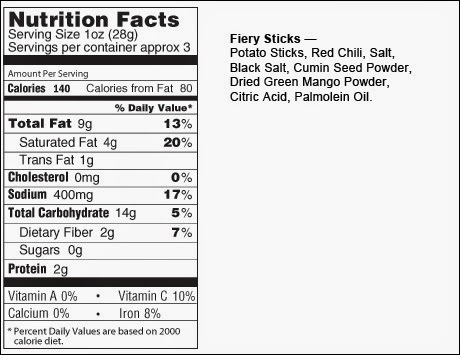 They also claim 0% trans fat (except for the fiery sticks, which have 1% trans fat), no cholesterol or MSG, and they are gluten-free. On the Web site the company states the snacks contain no GMOs.You can find more information about the company and their products on their Web site (link here). Do you prefer snack foods that are salty or sweet, and do you pay attention to the nutritional labels for snacks? Are there any ingredients that would stop you from buying a snack food?